As part of my monitoring process, I review the list of dividend increases every week. This helps me keep a pulse of dividend growth stocks I own, as well as the ones I may be interested in at the right valuation. The companies that raised dividends over the past week in review include Microsoft, McDonald's and W.P. Carey. In general, we want dividend growth stocks which have raised distributions for at least a decade, which was possible due to growth in earnings per share, and we want those at an attractive valuation. The quick review of each dividend raiser is focused on these general points of interest. McDonald’s Corporation (MCD) operates and franchises McDonald’s restaurants in the United States, Europe, the Asia/Pacific, the Middle East, Africa, Canada, Latin America, and internationally. The company hiked its quarterly dividend by 7.40% to $1.01/share. This marked the 42nd consecutive annual dividend increase for this dividend champion. As a McDonald's shareholder, I am lovin' it! I celebrated the dividend increase with the two cheeseburger number two meal at my local establishment. 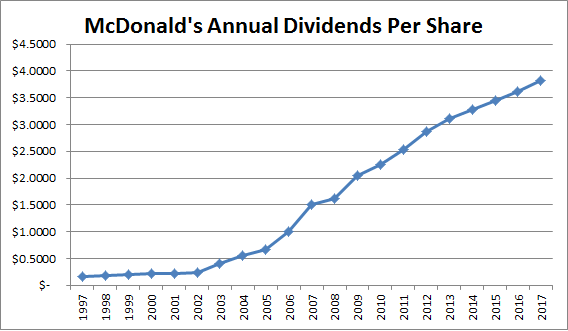 McDonald’s has managed to boost dividends at a rate of 13.70%/year over the past decade. This was supported by an increase in earnings from $1.93/share in 2007 to $5.44/share in 2016. The company is expected to earn $6.52/share in 2017. Currently, the stock is overvalued at 24.40 times forward earnings and yields 2.50%. McDonald's would be a better value on dips below $130/share, and an even better one on dips below $109/share. I came up with these values by multiplying the forward earnings for 2018 by 20 and the earnings for 2016 by 20. Share buybacks have gained prominence in the past twenty years. The amount corporations spend on buybacks exceeds the amount they spend on dividends. Plenty of investors mistakenly believe that dividends and share buybacks are equivalent. I prefer dividend payments. When a company declares and pays a cash dividend, this is yours to keep. You can do anything with that cash. The dividend represents a return on investment, and an instant cash rebate on your original purchase back. Every shareholders receives the same treatment per each share they own. Plenty of investors these days hate dividends, because of their tax inefficiency. When you earn dividend income, and you are in the high tax brackets, you can pay over 20% to the government. These investors forget that most stock in the US is now held in retirement accounts, where taxes are either deferred for decades or they are tax-exempt. So the easy solution for most investors in the US is to buy stock in retirement accounts. When a company declares a buyback, not all shareholders are impacted the same way (this example of course assumes that the company indeed follows through with the buyback, which is not always the case). When a company declares and executes a buyback, and you do not sell, you won’t have to pay a dime in taxes. Plenty of people love this idea, and focus on the tax efficiency aspect above everything else. However, the investors who sold their shares back to the company have to pay taxes on any gains, assuming they held the shares in a taxable account. By the way, if an index fund holds the stock, it needs to sell a portion of the shares, because the float is reduced from the share buyback. This is a guest post written by Mike McNeil, author of the Dividend Guy Blog and co-founder of Dividend Stocks Rock. 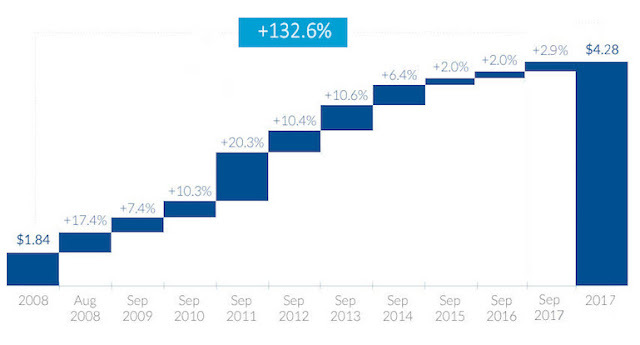 Mike is currently investing $100,000 in a 100% dividend growth portfolio as the market trades at an all-time high. Regardless where I look these days, I read alarming news about the stock market. Government debts are through the roof, there are tensions among many countries, debt is “too cheap” and we make a bad use of it, interest rates are climbing up and the stock market doesn’t listen to reality, like Icarus reaching for the sun. As Icarus’s story, once our wings will be burned by the sun, the fall will be fatal. This is obvious; everything is set to have the market crashes and burns. I recently quit my job as a private banker to work full-time on my investing website Dividend Stocks Rock (DSR). This is how I received $108,000 as a lump sum for my pension. What am I going to do with this new money? What should I do as a dividend investor? Should I keep money aside and wait for a correction? Over the past several weeks, there were three high yielding dividend growth stocks that raised distributions for shareholders. I am going to do a quick review on all three, using my criteria for evaluating dividend growth stocks. I review the list of dividend increases every week. I then narrow the list down based on a variety of criteria such as minimum streak of annual dividend increases. The end result from the list today includes three high yielding companies that raised dividends over the past two weeks. The companies include Philip Morris International Inc., Realty Income Corporation and Verizon Communications. Plenty of retirees I have gotten in touch with over the years seem to own those dividend machines. The question is, are those still good ideas today for accumulation? Philip Morris International Inc. (PM), through its subsidiaries, manufactures and sells cigarettes, other tobacco products, and other nicotine-containing products. The company raised its quarterly dividend by 2.90% to $1.07/share. This marked the 9th consecutive annual dividend increase for PMI. The new annualized dividend payment is $4.28/year. This is a decent rate of growth from the annualized dividend payment of $1.84/share in 2008. I have been reading about real estate crowdfunding platforms over the past several months. Many of these platforms seem to market to investors, showcasing high dividend yields in the 8% - 10%/year range. One of the most important factors that separate winning investors from losing investors is the ability to develop a process that you stick to no matter what happens. When you have a process, you take guesswork out of investing, and you stick to the plan through thick or thin. 2) I eliminate companies that sell at high P/E ratios above 20. I believe that even the best company in the world is not worth overpaying for. I would much rather buy a quality company at a favorable valuation, than overpay for future growth. Valuation is important. 3) I eliminate companies with high dividend payout ratios. Dividend safety is very important, which is why I want to have a margin of safety in order to lower the likelihood that dividends will be cut during the next recession. Since I plan to live off dividends in retirement, I only want to focus on the companies that can deliver dependable dividend income for me. 4) I also focus on companies that have managed to boost dividends by at least 3%/year over the past 5 and 10 years. We want companies whose dividend payments will at least match inflation. 5) Last but not least, we evaluate the ten year trends in company’s earnings per share. We want companies that grow earnings per share. This provides fuel for future dividend increases and increases the likelihood that the intrinsic value of the business grows over time. One of the largest debates I have seen involves the debate on index investing versus dividend growth investing. Plenty of individuals who have already made a commitment to a strategy argue fiercely why their choice is superior. An index investor will tell you that their way is superior to your way of investing. A dividend growth investor will tell you that their way is better. As usual, it is important to step back, and determine what drives those debates in the first place. I believe that those debates are ego driven and not that useful for your ability to invest to reach your goals. Both sides may resort to bending statistics and facts to their liking, in order to “win” an argument. This is a dangerous exercise, because these individuals are actually learning how to justify their preexisting biases, rather than think objectively. When you double down on your position on a certain topic, you are focusing on your side of the argument, but ignore anything else. The debate is further driven down the drain by interested parties whole sole livelihood depends on selling you index fund portfolios or selling you dividend stock services.